Entertain your important clients and guests in VIP style with Edgbaston hospitality & tickets. Birmingham’s premier cricketing venue has been the scene of some of the most thrilling international cricket matches of recent times. 2019 sees the return of the Cricket World Cup with Edgbaston hosting a number of exciting matches including notable England cricket fixtures. Official Edgbaston corporate hospitality & tickets in the 1882 Club and Warwickshire Suite will allow to soak up all the atmosphere and action in VIP style. Wednesday 19th June 2019 See this exciting Cricket World Cup fixture between the New Zealand and South Africa in VIP style with official corporate hospitality & tickets at Trent Bridge in 2019. Wednesday 26th June 2019 Be at the heart of the action as Pakistan clash with New Zealand in the 2019 Cricket World Cup. Secure your tickets and hospitality places at Edgbaston today. Sunday 30th June 2019 Enjoy official Edgbaston hospitality in 2019 for England v India in the exciting Cricket World Cup. Secure your very own VIP tickets and packages today. Tuesday 2nd July 2019 Savour a day at Edgbaston in style with official tickets and hospitality for the 2019 Cricket World Cup. Combine the action of India v Bangladesh with a VIP hospitality package. Thursday 11 July 2019 Enjoy official Edgbaston hospitality in 2019 for the Cricket World Cup Semi-Final match. Secure your very own VIP tickets and packages today. Thursday 1st - Monday 5th August 2019 Secure your official tickets and hospitality packages at Edgbaston for the Ashes 1st Test between rivals England and Australia in 2019. With a capacity of 25,000 it is the second-largest cricket ground in the United Kingdom, just behind the famous Lords Cricket Ground. It hosted its first ever Test Match in 1902 and has regularly hosted international cricket ever since. Along with world class international cricket Edgbaston has seen the very best county cricket on offer. In 1994 West Indies legend scored the highest ever first class score as he hit an astonishing innings of 501 against Durham. Who could ever forget England’s epic clash with Australia in the 2005 Ashes series? The match went right down to the wire as Michael Vaughan’s England side clung on for a two-run victory, the closest margin in Ashes history. But it will be best remembered for Andrew Flintoff’s show of sportsmanship at the climax of the game as he consoled Australian batsman Brett Lee. More records fell in 2015 during the extraordinary One Day International series between England and New Zealand. In the opening match of the series the hosts hit a remarkable 408 runs in their innings before going onto register their highest ever winning margin of 210 runs. One thing is for certain games at Edgbaston are rarely dull affairs. In 2019, you can enjoy the wonders of the Cricket World Cup at Edgbaston. Don’t miss a minute of the action as you and guests sit down to enjoy a VIP experience at Birmingham’s premier cricketing venue. 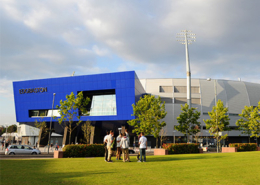 Edgbaston has undergone multi-million pound redevelopments over the past couple of years and now boasts some of the finest cricket hospitality facilities in the UK. You can see England’s matches at Edgbaston in 2018 from the outstanding 1882 Club hospitality facility. With a fine dining restaurant located inside the second tier of the Pavilion Stand, guests can enjoy stunning views of the action. With official category 1 seating located directly outside the famous 1882 Club, you can soak up the famous Edgbaston atmosphere as the match unfolds. Edgbaston hospitality guests will also enjoy a champagne reception, complimentary bar, afternoon tea, official match programme and a celebrity guest speaker. We are also delighted to offer the Warwickshire Suite. This superb corporate facility offers first-class hospitality in a premium shared restaurant. The Warwickshire Suite provides light and airy surroundings for guests combined superb pitch side views from the shared balcony on the 3rd tier of the Pavilion Stand. Don’t miss out on these fantastic Edgbaston corporate hospitality packages for England Cricket and ICC World Cup fixtures in summer 2019.